Follow scientists and technicians of the Hawaiian Volcano Observatory as they scramble to take the pulse of Big Island volcanoes in attempts to forewarn the public of impending eruption; progress is made, but complete understanding of these powerful forces of nature remains frustratingly elusive. Watch bad guys and harmless hippies as they cultivate illegal gardens of marijuana on the slopes of Kilauea Volcano, directly in the path of searing lava flows; some growers pay the ultimate price for their addiction to pot and its ill-gotten financial rewards. But above all, listen to Pele, the Hawaiian volcano goddess, as she manipulates success and failure, even life and death, of human intruders on her volcano home. 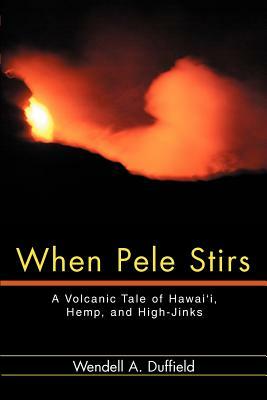 "When Pele Stirs" paints a realistic picture of life on the Big Island, and will help the reader understand why Christian missionaries have failed to eliminate the worship of Pele, in spite of their efforts to do so for nearly two centuries.